Media reports have described the many ways that cold temperatures have affected the 2018 Olympic Winter Games in Pyeongchang, South Korea. Razor-sharp, icy snow crystals have damaged skis, and some concert goers suffered from hypothermia prior to the opening ceremony. The region is known to be cold and dry; temperatures in February in Pyeongchang average -5.5 degrees Celsius (22.1 degrees Fahrenheit). 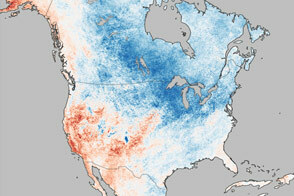 But NASA data show that the temperatures in the first days of the winter games have been colder than usual. 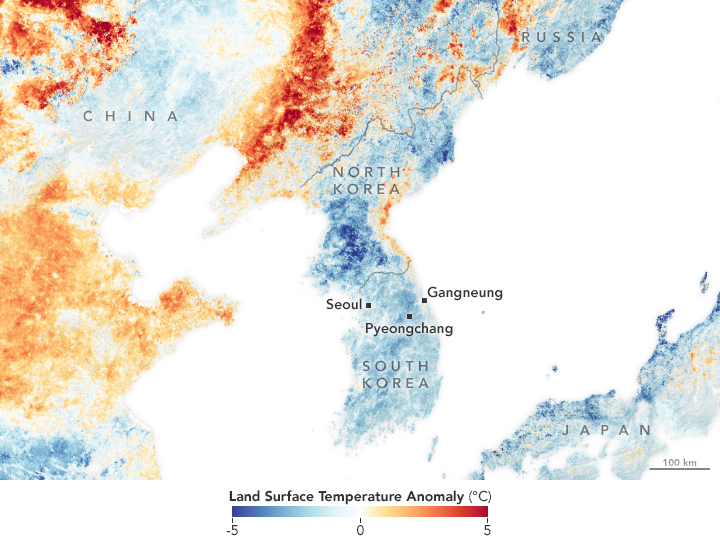 The map shows that colder-than-average temperatures prevailed across most of the Korean Peninsula. The line chart shows how land surface temperatures in the city changed over the course of a year. Early February 2018 is clearly colder than the same time in 2017. Cold is not the only factor affecting the games. Wind gusts up to 50 miles per hour have ripped through the region and caused some of the skiing events to be delayed or postponed. 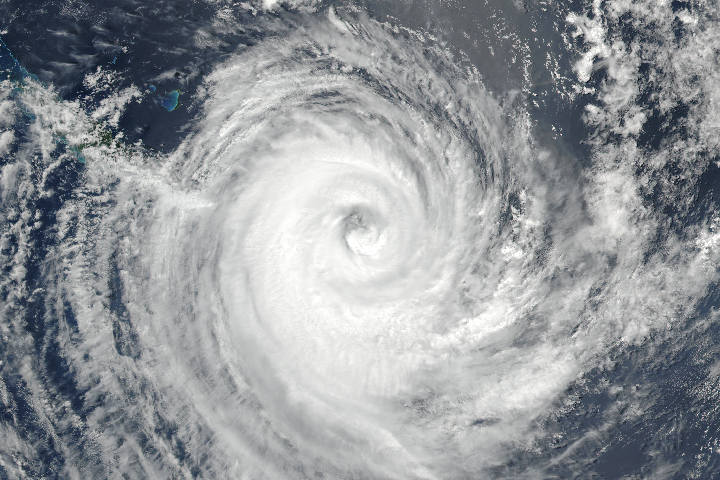 The natural-color image below was acquired on February 13, 2017, by MODIS on the Aqua satellite. Clouds over land appear to moving in the same direction as the winds, which frequently blow from Siberia toward the southeast. Snow is also visible in Pyeongchang, located amid the Taebaek Mountains, the site of the skiing and snowboarding events, as well as the opening ceremonies. 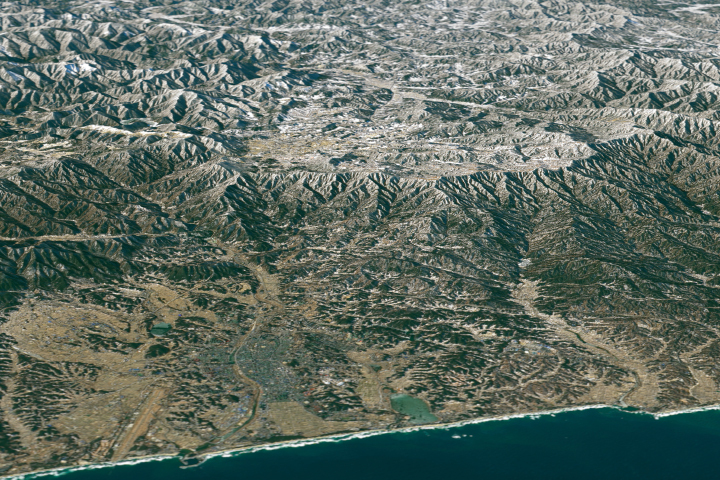 There is visibly less snow on the coastal plain near Gangneung, the site of Olympic ice events. See a detailed view of these two regions here. 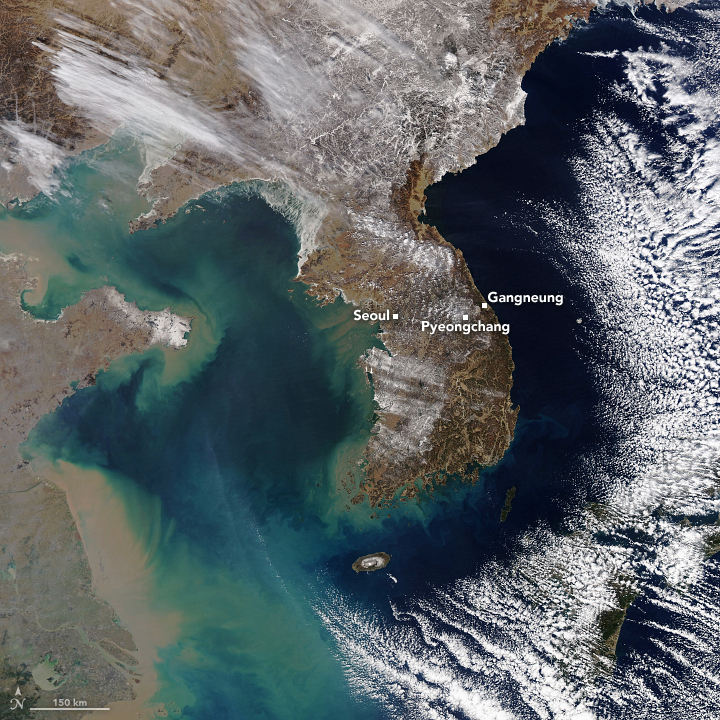 Scientists in NASA’s Short-term Prediction Research and Transition Center (SPoRT) have been tracking temperature, winds, and snowfall in Pyeongchang. 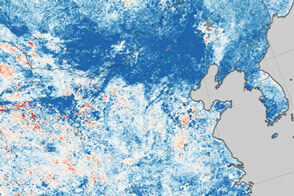 Their aim is to use observations and models to improve short-term, regional forecasts. You can read more about their work as it pertains to Pyeongchang on their blog and browse the output of their real-time weather model here. The modeling research is part of a larger effort by Earth science researchers who are conducting experiments and making observations during the games. The International Collaborative Experiments for Pyeongchang 2018 Olympic and Paralympic Winter Games (ICE-POP 2018) is a scientific field campaign taking place in Korea in February and March to study mountain-induced snowfall and other weather phenomena in the region. Read about their efforts on Earth Observatory’s ICE-POP blog, written by the scientists currently in the field. NASA Earth Observatory images by Joshua Stevens, using data from the Level 1 and Atmospheres Active Distribution System (LAADS) and LANCE/EOSDIS Rapid Response. Story by Kathryn Hansen. The temperatures in the first days of the winter games have been colder than usual. Business Insider (2018, February 8) It’s so cold at the Winter Olympics that skiers are being forced to throw away their expensive skis after practice runs. Accessed February 15, 2018. Forbes (2018, February 13) The Science Of Winds Affecting The 2018 Winter Olympics In PyeongChang, South Korea. Accessed February 15, 2018. 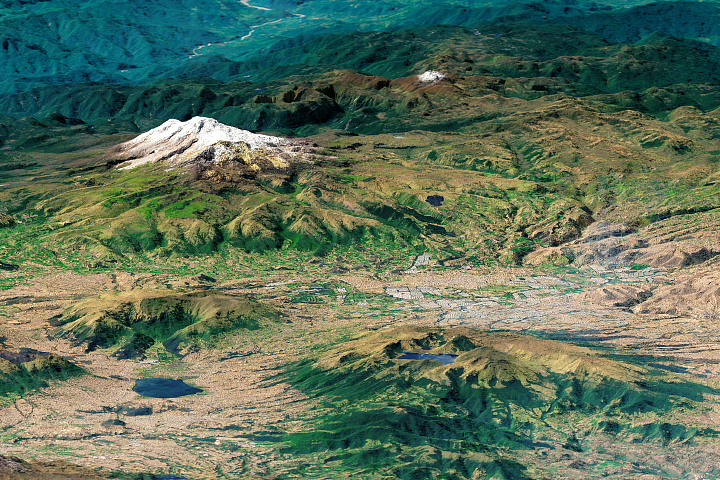 NASA Earth Observatory (2018, February 6) A View of the Winter Olympics from Above. 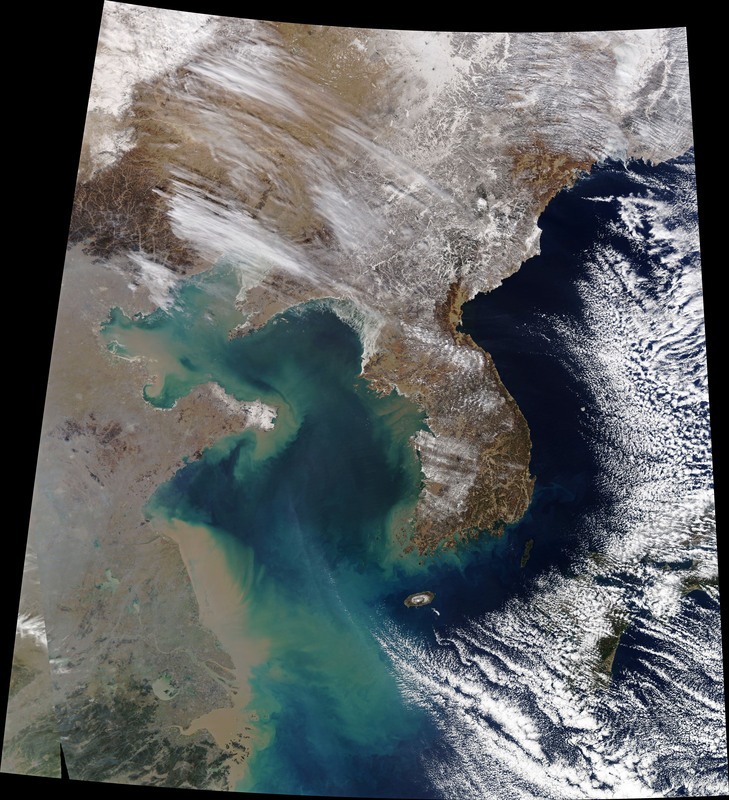 NASA Earth Observatory, Notes From the Field (2018, February) International Collaborative Experiments for Pyeongchang 2018 Olympic and Paralympic Winter Games (ICE-POP). Newsweek (2018, February 10) NASA is Making an Olympic Sport Out of Studying Snow in Pyeongchang. Accessed February 15, 2018. The Wide World of SPoRT (2018, February 7) NASA/SPoRT Providing Real-time Numerical Weather Prediction Guidance for 2018 Winter Olympics. Accessed February 15, 2018.